I first became acquainted with Harvey Littleton's extraordinary works in glass in June 1999... my brother Ward came to Charlotte to attend the wedding of a friend of ours, and the next day we decided to pay a visit to the Mint Museum of Craft + Design to see what was on display. When we arrived, the featured show was a collection of works by Harvey Littleton... amazing works made by layering colored glass inside clear glass. When we got home, I immediately hit the Internet looking for more information. I learned that Harvey Littleton was one of the first artists in the United States to start working with glass in a studio environment... if there is a father of the American studio glass movement, he's it. I also learned that his daughter, Maurine, owned an art gallery in Washington, DC, so I contacted the gallery to see if they had any additional information about Harvey's works. Maurine told me that Harvey had retired from glassblowing in 1990 (he was 68 years old at the time) to concentrate on the art of vitreographs, prints made using glass plates, but she still had a limited selection of his work available. Maurine sent me quite a few photographs of Harvey's works, and I spent quite a bit of time over the summer studying them. Since I was going to be in the DC area over the Labor Day weekend, I arranged to visit the gallery... my sister Lee and brother Ward accompanied me on the Saturday before Labor Day, and then I visited again by myself the following Tuesday. Of the works that were available, this one made the biggest impact on me, so I decided to acquire it. Conceptually, this work is actually fairly simple. Harvey began by layering special colored glass from Germany called Kugler colors on the end of a rod... from the inside out, he layered red, yellow, and blue glass, along with some threads of blue and orange glass. Around all of this, he gathered a layer of barium / potash glass. After forming the work to its final shape, he annealed the work. Once it was cool (which could take a week or more in the case of this work), he used a diamond-edged saw to cut off one end of the work; this became the smaller of the two elements. The other end of the work was also cut in order to create a flat base. Both elements were then polished to remove any rough edges. Don't be fooled by the name of this work; although the red layer is quite prominent, the blue and yellow layers surround the red layer... hence the name. 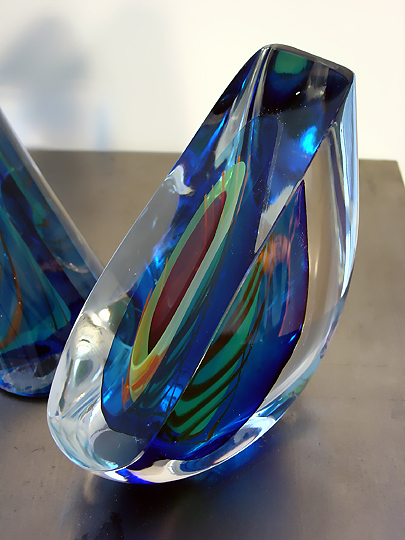 Although the methods that Harvey used to create this work would now be considered quite simple (and therefore somewhat easily reproduced by other glass artists), I've never seen anyone use them as effectively as Harvey has done in his work... this work makes quite a visual impact, and I am constantly amazed by how cool it is. This is, historically speaking, one of the more "important" works in my collection, and I am extremely pleased to have had the opportunity to acquire it. 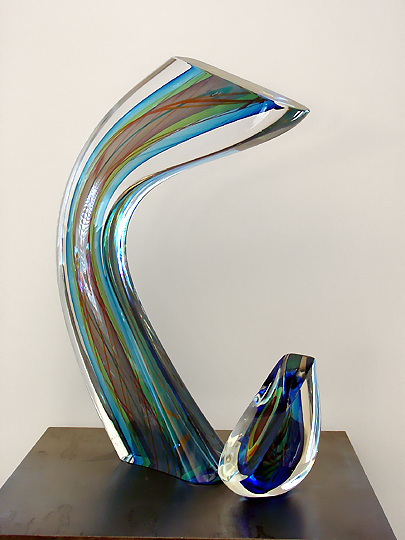 Since this work was created in 1989, it's one of the last works in glass created by Harvey before his switch to vitreographs.